It’s very possible that the modern leather sofa you buy today will someday be found in the same category as your great-grandfather’s antique Chippendale settee. Not because they resemble each other in any way, but because they were both products of an era of innovative design in home furnishings. In fact, to some degree, “Modern” designs of the 20th century are already starting to be considered classics. The recent beginning of a new millennium has contributed to a nostalgic re-assessment of the furniture styles we grew up with. Modernism and Retro, two overlapping but distinctive looks, are hugely popular categories in today’s home furnishings and interior design. It’s easy to get the terms mixed up but, in brief, Modernism refers to highly refined, minimalist furniture that’s part and parcel of 20th century modern art and architecture. There are great architects and designers associated with this era: Gropius, van der Rohe, Breuer, Aalto, Eames, and Saarinen are just a few of the best. Retro (short for retrospective) looks back through a different lens. It’s on the same timeline as Modern, but doesn’t take itself so seriously. There’s a touch of humor with Retro, with styles that look back to the 1930s Art Deco and 1950s sitcoms. In fact, old movies and television and the nostalgic attitudes they inspire have as much to do with retro as style or time period, so don’t be confused or dismayed by the blurred boundaries between Retro and Modern. To add to the mix, there’s so-called “Contemporary” styling, a signature trend right now. 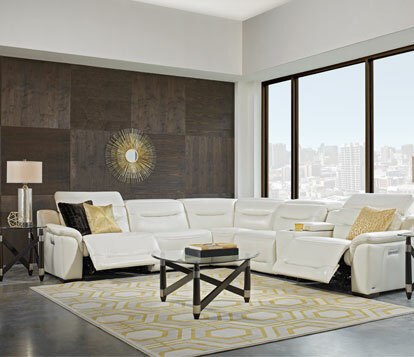 That includes "lifestyle furniture,” with easy lines that appeal to a wide range of tastes and personal styles. Lifestyle is the sports utility vehicle of home furnishings: in-style, popular, comfortable and family-friendly all at the same time. Modern, Retro and Contemporary have their differences, but they also share a 20th century energy. It all began with artists, architects and furniture designers seeking a way to shed the stuffy, over-decorated style of the Victorian era. At the end of the 1900s, two alternatives arose. The first was the Arts and Crafts (or Mission) Style noted for clean lines, honest craftsmanship and integrity of construction and materials. The second (and radically different) influence was Art Nouveau, a curvilinear style inspired by the organic curves of flowers, vines and tendrils. Although Arts and Crafts and Art Nouveau precede the Modernist/Retro era, they definitely helped set the stage for a new century of design ideas and a fresh way of interpreting home and interior design. In the years between the two world wars, a new set of design trends developed. In a world that was becoming increasingly enamored with speed and technology, designers rediscovered the beauty of simple geometric forms. Characterized by its liberal use of circles, triangles and parallel lines, Art Deco spread like wildfire from France, throughout Europe and, finally, to the US. From road-side diners to Radio City Music Hall, exuberant Art Deco ruled the landscape, literally and figuratively, in the 1920s and 30s. Think: Chrysler Building, Busby Berkeley movie musicals, the paintings and bronzes of Erte. Controlled, rounded lines characterize early Art Deco, but the look grew slimmer, sleeker and less decorated over time. Later, Art Deco came to be known as “Moderne,” and it was this look that gradually led into what today we call Modern design. Modernism’s other great influence grew out of the minimalist design aesthetic known as International Style, which was taking root in Europe, most famously at Germany’s Bauhaus School of Art and Design. Like their Mission predecessors, the modernists were committed to integrity and utter simplicity in design: “less is more,” in the words of architect and designer Mies van der Rohe. But both Art Deco and Modern evolved via technologies and materials that fostered creative and innovative design ideas. Modern’s next huge step came after World War II, when Scandinavian, Italian and American designers began creating strong, clean-lined and startling furniture. Whether the squared-off Danish Modern teak pieces, or the brilliant and dramatic designs of Charles and Ray Eames and other “Mid-Century Modernists,” the era set the stage for the remainder of the 20th century, marked by a feeling that there were no rules that couldn’t be broken and, in fact, most rules SHOULD be broken at least once. The best of these great designs are held in the highest esteem by today’s collectors and interior designers. Casual Contemporary is today’s preferred look, family-friendly and casually sophisticated. Its lean lines and strong silhouettes are indebted to modern design, but relaxed a bit for comfort and ease. Comfort also prevails in sofas and chairs, with softened fabrics and oversized styling for cocooning. The simple lines of Casual Contemporary may be distilled from Mission, American Country or Shaker design, but with an updating of materials, construction and styling for today’s tastes. Casual Contemporary takes its place in the stream of 20th century design as the final big design trend before the end of the millennium. Because the best of Contemporary design tends to be a melding of the influences that preceded it throughout the 20th century, it is a malleable force in today’s interiors, allowing you to express your individuality without sacrificing comfort, elegance or quality of craftsmanship. If it’s true that “everything old is new again,” then we can be assured that 20th century design will endure, and will find its place among the great and timeless classics of past centuries.